Hard Rock Hotel & Casino, Las Vegas, Nevada – Lucas Martin Matthysse (32-2, 30 KOs) dominated Ajose Olusegun (30-1, 14 KOs) in one of the most entertaining one-sided fights of the year, scoring the stoppage at the 2:59 mark of the tenth round. Matthysse, who is known for his slow starts, started out fast in the face of Olusegun’s fast-paced, aggressive combination punching. Olusegun was looking to let his hands go in combination, while Matthysse was comfortable working his way inside to bang Olusegun to the body. It was the body work of Matthysse that opened the doors upstairs, as his vaunted right hand became a factor after a few hard shots downstairs. Matthysse nearly had Olusegun down and out in the second round. After a slow first minute to the round, Olusegun took control in the second minute, but gave away the momentum – or rather had it snatched away – in the third minute, as Matthysse’s right hand and left hooks to the head had referee Russell Mora taking a serious look at a wobbled Olusegun staggering around on the ropes. The narrative continued over the next five rounds; Lucas Matthysse dominating and hurting Olusegun, who never stopped throwing punches and refused to go down when he was hurt. It wasn’t until the eighth round when Olusegun had a clear round in which he could be given the ten points. 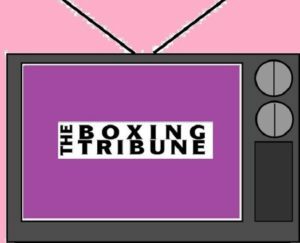 Matthysse looked to lose some of the steam on his punches, and Olusegun landed several right hooks, often in triplicate, as he moved around the ring. Olusegun had another good round to start the ninth, but his lack of serious punching power couldn’t discourage a hard-charging Matthysse. It was Matthysse who again took over in the last minute. A right hand rocked Olusegun with five seconds remaining in the round. A follow up left hook at the bell had Olusegun staggering back to his corner. The tenth round was all Lucas Matthysse, who dominated from the opening bell. He landed a big right hook, forcing Olusegun to tie him up, and before Russell Mora could get in range to break the fighters Matthysse landed a hard left hook. Mora called time to allow Olusegun a change to recover and give Matthysse a warning for hitting on the break. 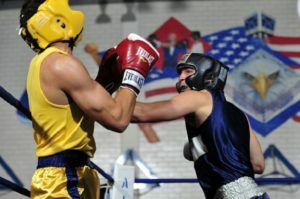 Both men came out aggressive when the action resumed. 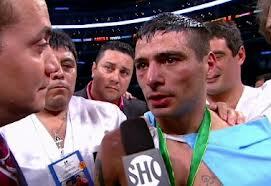 But it was Matthysse who won the small battle of attrition, allowing him to unload to Olusegun’s body and head. With only ten seconds remaining in the round, Matthysse rocked Olusegun with a left hook, sending him to the ropes. Matthysse followed his attack up with a huge right hand-left hook-right hook combination. The left hook sent Olusegun down, while the last right hook landed flush while Olusegun was falling. Russell Mora had seen enough and waved the fight off as the bell to end the tenth round sounded. Matthysse, who should now be considered a real player in the jr. welterweight division, welcomed all challengers in his post fight interview. 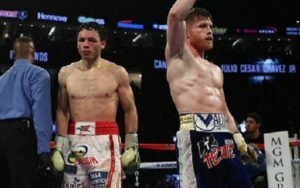 Olusegun, who showed a great deal of toughness and heart, blamed his performance on ring rust, but was respectful and congratulatory towards Matthysse. Unbeaten middleweight prospect J’Leon Love took on Ramon Valenzuela on the televised undercard. Love was a class above Valenzuela, who had his moments in the fight. Love took over after the third round when he began to dish out steady punishment. Valenzuela was docked a point for attempting a double-leg takedown near the end of the seventh round, and after absorbing more punishment in the eighth, he was disqualified for the same tactic. Love improves to 13-0, with seven knockouts, while Valenzuela drops to 7-2.